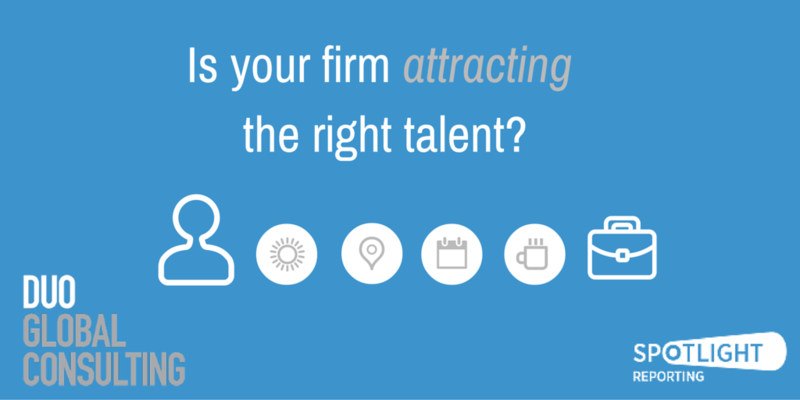 Is your Firm Attracting the Right Talent? When people talk about ‘brand’ they often think solely from a customer perspective. However, a strong employer brand is critical for attracting the right talent. A company’s employer brand is twice as likely to drive job consideration as its company brand. With the shift in skill-set requirements in accounting, and Gen Y entering the workforce it’s more important than ever to know if you are attracting the right potential employees. We talked to Laura Weaving, who’s had a career in managing worldwide recruitment operations and moved on to found Duo Global Consulting, for her tips on how to attract potential employees. Laura realised a definite gap in the market for a strategic and long-term effective talent solution and is passionate about working with companies to build an effective talent brand that engages the best talent, creative recruitment strategies to attract them, and engaging development processes to keep them. The first thing I always look and address with my clients is their employer brand - and what it says about them as an employer. Gen Z and Gen Y candidates are 61 percent more likely to have their job consideration levels associated with employer brand, and as a result, if your talent pool depends on younger demographics, your employer brand is crucial. A company’s employer brand depends on their EVP (Employer Value Proposition), which is their unique set of offerings, associations and values that positively influence target candidates and employees. Without it, it’s extremely hard to attract the right potential employees and even harder to hire someone who is the right fit for your company. Overall, companies without an employer value proposition and a weak employer brand, report a cost per hire that is almost double that of companies with a strong employer brand. When it comes to attracting talent, a strong employer brand therefore not only increases consideration, it is also a smart business investment. Additionally, if an organisation has a strong employer value proposition and employer brand, especially one that resonates with current employees, it will also have a significantly lower staff turnover rate. Companies with a stronger employer brand have a 28 percent lower turnover rate than companies with a weaker employer brand. The first step to developing an employer value proposition and effective employer branding is to assess your audience. Organisations need a strategic platform, with a compelling message at its core. This message should be the result of a thoughtful research program which assesses target audiences, tests messages, and highlights the mediums in which ideal talent pools will consume your employer information. Without them, you will most likely execute the same recruitment programs over and over again, with the same average results. Once you have that profile, you can build questions to ask to ascertain whether potential employees fit your ideal profile and you can tailor the advert and medium to speak to that profile. I avidly recommend that companies succession plan and work proactively to develop talent pools. You should be looking at what positions you will need to hire in six to twelve months and what skills are required so you can build an internal talent pipeline. You don’t want to be working against the clock when the need arises to hire, you want to work ahead of that point and build a relationship with your ideal candidate. Additionally, with a lot of ideal candidates being already happy in their current roles, you will require the time to build that relationship. Ensuring that your employer brand expresses your culture, environment, values and strategic vision is important. Investing to strengthen your employer brand, if done right, should help increase consideration of your company, lower recruiting costs, and decrease voluntary turnover.